HOPPE Monte carlo | Tilt and Turn Window Handle | Find out! Hoppe tilt and turn window handle Monte Carlo series on oval rose. 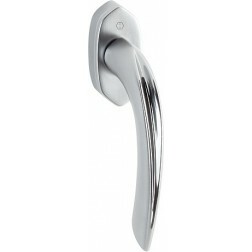 Hoppe tilt and turn window handle Monte Carlo series is robust and luxurious. It is constructed with solid brass. The components of this handle have been intended to last for more than 10 years. Bicolor finishes are protected by a guaranteed surface up to 10 years. Moreover Secustik system protects your windows against break-ins.